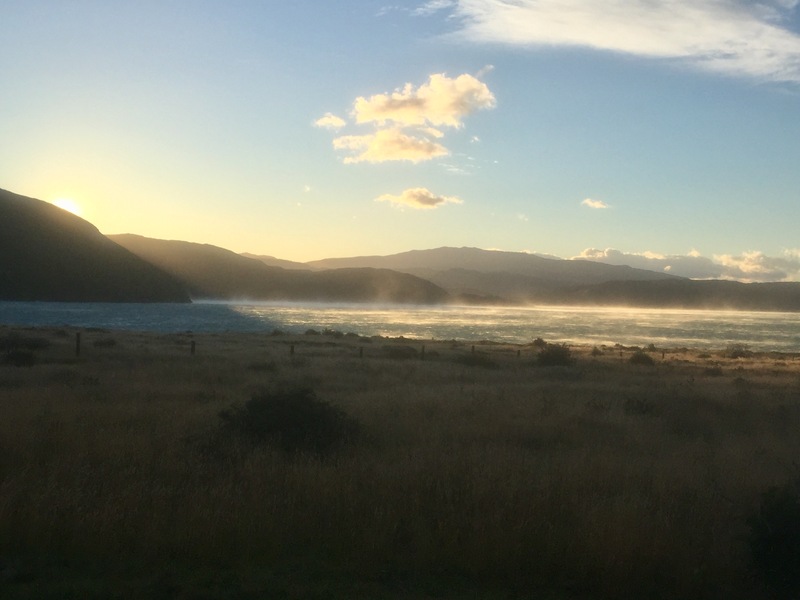 This morning the sun came up over the ridge as brutally strong winds whipped up Lago Grey, dragging aloft a fine mist which made rainbows. One of the most common words in The Voyage of the Beagle is “wind,” but of course that’s to be expected in a nineteenth century book about a sea voyage. Winds always howl and even scream when literary ships round the Horn, but the word appears just as often in Darwin’s descriptions of his land journeys, and the bulk of those are in Patagonia. The Voyage details a nearly five year circumnavigation, touching at numerous exotic places (he was one of the world’s first eco-tourists), so I find it striking that in the conclusion Darwin singles out Patagonia: “In calling up images of the past, I find that the plains of Patagonia frequently cross before my eyes; yet these plains are pronounced by all wretched and useless.” When I let my mind simply drift over long treks, what is most vivid is usually not the picturesque—more often the memory partakes of the open: the vast, the empty, and usually the windy. Darwin’s “plains of Patagonia are boundless, for they are scarcely passable, and hence unknown: they bear the stamp of having lasted, as they are now, for ages, and there appears no limit to their duration through future time.” Of course they are passable. The cordillera and some strong rivers make passage difficult, but what Darwin speaks of is not obstacle but difficulty, rugged terrain, profound weather, and an abiding sense that, like Thoreau’s Ktaadn, this is not a place for humans to linger. There is something special about the wind in the Southern Hemisphere. Apart from being in or near hurricanes, or perhaps standing on top of Mt. Washington, I don’t recall any time in the north where I felt I would actually be sent sprawling by common, everyday wind. In the deep (global) south it’s another story. I was blown off the north side of Mt. Tongariro with gale force winds, horizontal rain, and zero visibility. Just outside of Wellington I crossed a ridge where I first staggered, and then had to hold onto my pack to keep it from being torn off. Several times on the South Island I simply had to sit to avoid falling. My walk yesterday back from the Grey glacier was in calm weather, enough to make me forget how strong the wind blew the day before. When I arrived at Paine Grande, the flags were simply rustling, but I considered what I thought would be prevailing winds when setting up my tent. A word about my tent— I have an unnatural attachment to my one pound, Cuben fiber ZPacks soloplex. My trekking poles are the tent poles, and the floor is exactly the size for my gear + me. I have spent many a comfortable night in it, but it is open all around, so wind generally makes it heave and shake, but not fail. The only exception thus far was my second night in it. After spending my first on New Zealand’s Te Araroa Trail in a campsite, I had to follow the ninety mile beach and therefore camped one night just back in the dunes. Of course that night a huge storm blew in, the pegs would not hold in sand, so I spent most of the night in the rain lying on top of my now-favorite tent to keep it from blowing away. Since then, it has never failed, though I have spent some nights awake holding the poles in place as the wind howled and sometimes screamed. Last night, I went to sleep in a sweet calm (after the American college students in the next tent who clearly had skipped high school goverment class finished talking politics). Around 2:00 the winds came in and did not stop the rest of the night—no sleep, just constant flapping. I well remember spending summers on the ocean at Nags Head, North Carolina, where you might not know what day of the week it was, but you damn sure knew when the tide came in and which way the wind was blowing. Wandering the Southern Hemisphere brings back that element. Daily life is significantly directed by the strength and direction of the winds, and in some circumstances, your very life is dictated by it. I think what drew Darwin’s (and Chatwin’s) memory to Patagonia is this elemental nature, one that brings awareness, and strips you raw.